Hundreds die in 7.3 earthquake–is a much worse quake coming to the USA? TEHRAN, Iran (AP) — A powerful 7.3 magnitude earthquake near the Iraq-Iran border killed over 350 people across both countries, sent residents fleeing their homes into the night and was felt as far away as the Mediterranean coast, authorities said Monday. 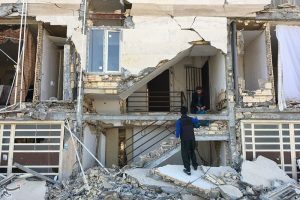 Iran’s western Kermanshah province bore the brunt of the temblor Sunday night, with authorities saying the quake killed 348 people in the country and injured 6,603. Kermanshah is a rural, mountainous region where residents rely mainly on farming. The families of those affected are in my prayers. The Kermanshah earthquake seems consistent with Jesus’ prediction that there would be earthquakes in diverse places. Jesus listed earthquakes as part of the signs that precede the Great Tribulation (Matthew 24:4-21; see also When Will the Great Tribulation Begin? 2017, 2018, or 2019?) and told His followers to watch. It is not only remote mountainous regions that can be affected by deadly earthquakes. Perhaps this would be a good time to report about what is considered to be a major risk in the Midwest of the USA–the New Madrid Fault. The New Madrid Seismic Zone (pronounced /nuː ˈmædrɪd/), sometimes called the New Madrid Fault Line, is a major seismic zone and a prolific source of intraplate earthquakes (earthquakes within a tectonic plate) in the southern and midwestern United States, stretching to the southwest from New Madrid, Missouri. The New Madrid fault system was responsible for the 1811–12 New Madrid earthquakes and may have the potential to produce large earthquakes in the future. Since 1812, frequent smaller earthquakes have been recorded in the area. In a report filed in November 2008, the U.S. Federal Emergency Management Agency warned that a serious earthquake in the New Madrid Seismic Zone could result in “the highest economic losses due to a natural disaster in the United States,” further predicting “widespread and catastrophic” damage across Alabama, Arkansas, Illinois, Indiana, Kansas, Kentucky, Mississippi, Missouri, Oklahoma, Texas, and particularly Tennessee, where a 7.7 magnitude quake or greater would cause damage to tens of thousands of structures affecting water distribution, transportation systems, and other vital infrastructure.The earthquake is expected to also result in many thousands of fatalities, with more than 4,000 of the fatalities expected in Memphis alone. According to the USGS, there is a broad consensus that the possibility of major earthquakes in the New Madrid Seismic Zone remains a concern, and that the GPS data do not provide a compelling case for lessening perceived earthquake hazards in the region. One concern is that there is no evidence of reduced earthquake frequency over time, as would be expected if all present-day activity were caused by aftershocks of the 1811–1812 events; another is that the 4,500-year archaeological record of large earthquakes in the region is more significant than ten years of direct strain measurement. The USGS recently issued a fact sheet reiterating the estimate of a 10% chance of a New Madrid earthquake of magnitude comparable to those of 1811–1812 within the next 50 years, and a greater chance of a magnitude 6.0 earthquake in the same time frame. The New Madrid Fault is a major risk, and an area to watch. The Cascadia Subduction Zone, which forms the boundary between the Juan de Fuca and North American plates, is a very long sloping fault that stretches from mid-Vancouver Island to Northern California. The last known great earthquake in the northwest was the 1700 Cascadia earthquake. Geological evidence indicates that great earthquakes (> magnitude 8.0) may have occurred sporadically at least seven times in the last 3,500 years, suggesting a return time of about 500 years. Seafloor core evidence indicates that there have been forty-one subduction zone earthquakes on the Cascadia subduction zone in the past 10,000 years, suggesting a general average earthquake recurrence interval of only 243 years. Of these 41, nineteen have produced a “full margin rupture,” wherein the entire fault opens up. By comparison, similar subduction zones in the world usually have such earthquakes every 100 to 200 years; the longer interval here may indicate unusually large stress buildup and subsequent unusually large earthquake slip. There is also evidence of accompanying tsunamis with every earthquake. One strong line of evidence for these earthquakes is convergent timings for fossil damage from tsunamis in the Pacific Northwest and historical Japanese records of tsunamis. The Cascadia Subduction Zone is a major risk, and an area to watch. It can also cause tsunamis and possibly trigger volcanic eruptions. This could affect places like Mt. St. Helens, Mt. Rainer, and/or all Yellowstone–all of which could cause major damage. It is not just places like Iceland and New Zealand that are subject to volcanic devastation (watch also Are supervolcanoes a real threat?). Are supervolcanoes a real threat? The USA and many other parts of the world are at greater risk for damage by earthquakes and volcanoes than most imagine. Does the Bible predict the big one, an earthquake bigger than most geologists think possible? Well, living in California, we often hear the idea that the “big one,” an enormous earthquake that will some day take place. In March 2011, when I saw “experts” discussing this, they indicated that it was not possible to have an earthquake along the San Andreas fault greater than about a 7.5-8.5 magnitude because of how the fault is laid out. And while some in California might find that a little reassuring, the Bible speaks of a bigger earthquake ultimately coming. California and other parts of the world may have one or more “big ones” before this happens. According to the Roman historian Pliny the Elder, the Lydia earthquake of 17 A.D. was the “greatest earthquake in human memory” (Keitel, E. “Tacitus and the Disaster Narrative”. In Kraus C.S., Marincola J. & Pelling C. Ancient Historiography and Its Contexts: Studies in Honour of A. J. Woodman. Oxford University Press, 2010, p. 335. ISBN 9780191614095). But a bigger one is coming, a few years after the start of the Great Tribulation. It should be noted since the biggest of all earthquakes seems to take place near the end of the Day of the Lord, it probably cannot happen prior to 2024 (for more on why as well as dates, please see the articles When Can the Great Tribulation Begin? and Does God Have a 6,000 Year Plan? What Year Does the 6,000 Years End?). So, what about the ones happening now in places like Kermanshah? These quakes should serve as notice that biblical prophecy will be fulfilled and that all should believe the prophecies in the Bible. Including those prophecies that show that the kingdoms of this world will be replaced relatively soon by the Kingdom of God. People should live their lives as if God does exist and that He does have a plan, because He does, and it will come to pass. This entry was posted on Monday, November 13th, 2017 at 7:30 am	and is filed under Prophecy. Record tying Oklahoma earthquake felt as far away as Arizona, but bigger ones are expected!